If you could strengthen, enrich and renew your marriage in one day, would you? Hosts of Agape Marriage Connection and facilitators of Re-Engage small groups, Mike and Laurie Sheffield believe that a strong marriage is at the heart of every home. With an emphasis on helping married couples form a relationship with each other through His Word, His Spirit, and His people, the Sheffield's have helped many to reconnect, recommit, and rededicate their lives to each other through Christ. With humor and relationship banter that is both relatable and fun, Mike and Laurie bring couples together in a way that is affirming and engaging, providing them the tools they need to create a thriving marriage that will last a lifetime. Since 1984 Dr. Stephens has practiced as a licensed Psychologist specializing in marriage, family, stress, depression, trauma and life-adjustment issues. He also acts as a life coach to people of all ages and professions. Dr. Stephens is a popular seminar speaker who has spoken to business, non-profit, professional and church groups throughout the country. He has written over 20 books with over a million copies sold. He is a co-founder of Every Marriage Matters, Inc. He has also been on the leadership team of his local church for over 15 years. Dr. Stephens loves life and encouraging others. He also loves learning and having fun. But most of all he loves God, his wife Tami, and his three kids. 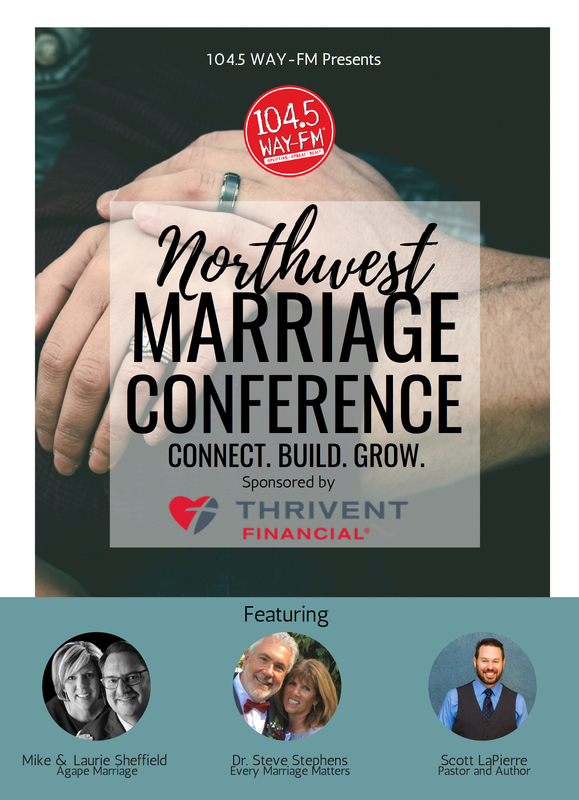 Pastor and author, Scott LaPierre takes a Biblical look at marriage and the way we should act out God's love in our relationships. From his book description: "At its best, marriage brings joys and blessings rarely seen in this life. At its worst, marriage generates pain and conflict, often because husbands and wives do not fully understand their roles and responsibilities. Scott LaPierre combines clear teaching from Scripture with practical application for daily married life to encourage, challenge, and equip you to experience a healthy, joyful, Christ-centered relationship." Scott is Senior Pastor of Woodland Christian Church in Woodland, WA. Mike & Laurie Sheffield - When was the last time your marriage had a physical? We might head to the doctor every year, but when was the last time you did a marriage “check up"? Does your marriage have “high blood pressure” causing arguments? Or is there a lull in your heartbeat and passion? We all want to be known and understood by the person we live with. There is a huge connection between knowing your spouse, and intimacy in healthy marriages. Success in marriage isn't avoiding divorce, but moving towards a healthy oneness, that declares you know each other! The Old Testament is filled with marriage accounts, and they contain great (and sometimes humorous!) instruction for us. As husbands and wives, we learn what to do – and not do – by examining them!. Dr. Steve Stephens - The Secrets to an Exciting Marriage: Love, Romance & Intimacy! How God uses these three factors to bring you closer and closer every year you are together. Also how these lengthen your life, reduce your anxiety, increase your satisfaction with life and divorce-proof your marriage. What does your faith have to do with how you manage your money? What do your spouse's spending habits have to say about your faith and finances? Tired of disagreeing about how each of you spends money from month to month? Want a healthy, Christ-centered format for financial responsibility to last a lifetime? Let the Thrivent Financial team teach you how to do more with your money while following Christ's example for a life of helping those in need. Conflict is inevitable in relationships of all kinds, but it shouldn't cause strife in your marriage. Learn ways to live together in harmony and navigate the differences of opinion that naturally pop up from time to time. Gain tools that lead to understanding your spouse's perspective and builds the marriage foundation up while bringing you closer as a couple. Thought starting over with someone new would be a breeze? Thought your children and your spouse’s children would naturally blend together well? It doesn’t matter the age of your children, 5 years old or 45, they share the same experience/feelings. Feeling the strain of time management demands too? In collaboration with the . . . Registration is $59 per couple and $69 per couple after Feb 21st. Register Today!